Originally published under the title "Mulcair Lost by Bowing to Islamism." Former New Democratic Party (NDP) Leader Thomas Mulcair defended the right of a Muslim woman to wear the niqab during her Canadian citizenship swearing-in ceremony. Thomas Mulcair, the man who could have been Canada's first New Democrat prime minister, will now be remembered as a blip in the country's political history. Having lost last year's election, and not having had the grace to step down as leader of the party at that time, Mulcair was unceremoniously dumped by party activists at last week's NDP convention in Edmonton. The conventional wisdom is he was fired by the NDP for losing the election by trying to steer the party towards victory along a path that sacrificed the party's social democratic heritage. The truth, however, lies elsewhere. Despite Mulcair's lurch to the right, he could still have been prime minister had it not been for his outlandish support for the right of a Muslim woman to wear the Islamic niqab at her Canadian citizenship swearing in ceremony. The issue so captured the minds of Canadians that Maclean's, in its Sept. 25, 2015 issue, labelled the campaign "The niqab election." 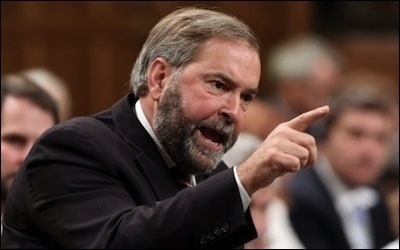 By his own admission to CBC radio on Feb. 13, Mulcair said his backing of the niqab cost the NDP heavily. He told Chris Hall on CBC Radio's The House, "(The niqab) hurt us terribly ... I can share with you that the polling we did showed we dropped over 20 points in 48 hours here in Quebec because of the strong stand I took on the niqab." Even in this admission, Mulcair made it sound as if he had stood up for Rosa Parks, not a Pakistani immigrant telling Canadians how we need to change our laws to accommodate her. Even though Prime Minister Justin Trudeau, as leader of the then third place Liberal party, also backed the niqab, there was more at stake for Mulcair because the NDP's power base was in Quebec, where people were vocally against all things overtly Islamist. Indeed, in the middle of the federal election campaign, at least four sitting MPs of the NDP from Quebec denounced the party's niqab policy. But this subject, central to the NDP's election debacle, did not come up at last weekend's convention. Not one word was said about Mulcair's decision to defend the most misogynistic apparel on earth, one that stamps women as physical possessions to be protected from the supposed sexual depravity of men. Like ostriches, and similar to left wing parties around the globe, the New Democrats simply wanted to stay away from any culture war involving Islamists. Islamism has become the new sacred cow of the left. Islamism has become the new sacred cow for the left. No criticism of anything related to Islamic sharia is permitted, as if such discourse itself is blasphemy. There is also a bizarre movement among left wing feminists to label oppressive anti-women laws written by Muslim men as a human right of Muslim women, with any criticism of these laws labelled as Islamophobia. New Democrats had a chance to fight Islamist misogyny but instead chose cowardice and, post election, have avoided discussing the niqab issue as if it had never happened. Canadians, especially the Québécois, will not elect NDP apologists for Islamism today or in the future. New Democrats should recognize the elephant in the room for what it is -- a challenge to secular liberal democratic society and individual liberty. They should listen to Trevor Phillips, Britain's former human rights commissioner, who popularized the term "Islamophobia" in 1997, but now admits he "got almost everything wrong" on Muslim issues, noting many followers of Islam are creating "nations within nations" in the West.